Since "Posting ads" is the main action of users, it's also the main method for you to generate revenue. You should always remember to create "Posting ads" form for your users to display their projects. Please note that if you wish to use Paypal or 2Checkout in payment transactions, you will need to check if your currency is supported by these payment gateways. If it is not supported, you may use Cash method. 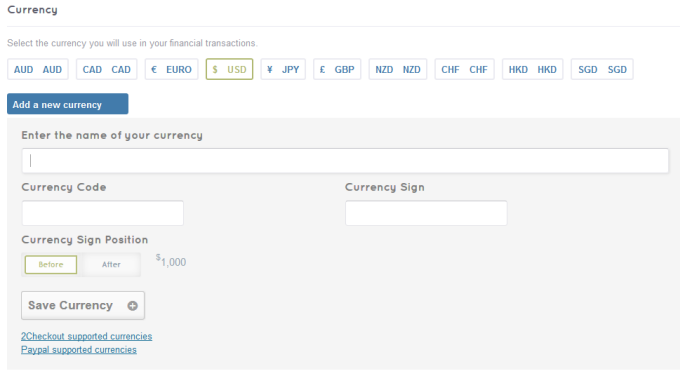 To choose a currency, select one you want to use from our default currency list. You can access the list by clicking Engine Settings > Settings > Payment from back-end. If your desired currency is not in the option, add it to the list by doing the steps above. Admins can change the currency sign as well as decide how it appears (left or right of the amount). Please note that this setting is for the price data in each ad, which is not related in any way to the currency settings for the payment process applied for sellers. For example, when you change the currency in the Payment settings to “USD”, the sellers will make the payment to you in USD when they post an ad in your site. But if you modify the currency sign in the Ads settings to “VND” & the currency position to “Right”, the price data of each ad will appear with “VND” following the amount. Payment plans are price packages you can create to give your sellers smart choices for their ads. 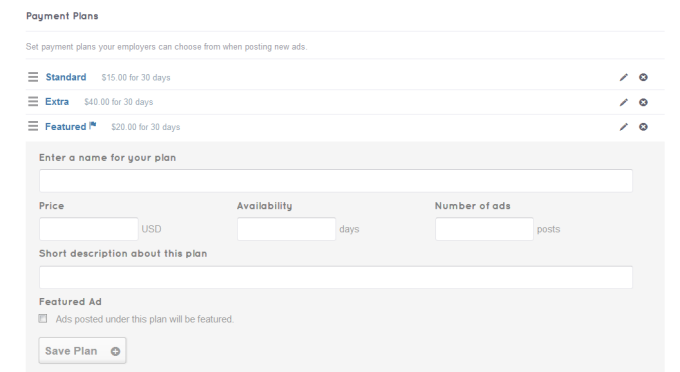 Each payment plan shows the price, the time period an ad will be active on your site, and if an ad is regular or featured. 1. Enter a payment plan’s name, price, number of ads, and ad’s post duration. You can also write a short description of the plan. 2. Tick Featured Ad box if you wish all ads under this plan will be Featured. 1. Go to Engine Settings > Settings > Payment > Payment Plans. 2. Choose which plan to edit and click the pencil icon next to it. 3. 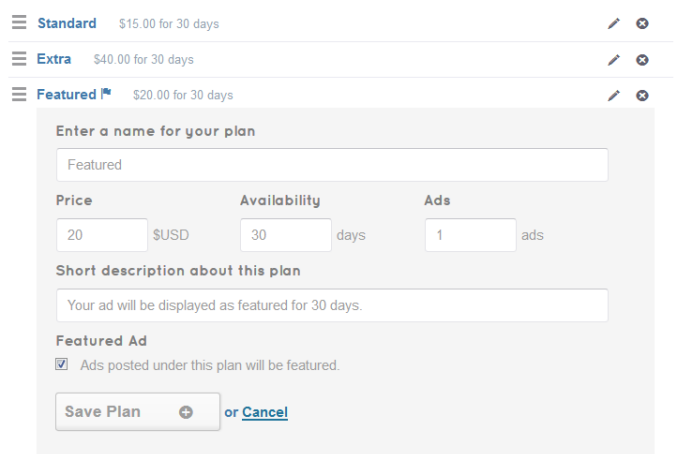 Make your changes on fields you wish to modify: payment plan’s name, price, availability, and number of ads. 4. Check the Featured Ad box to make a regular plan a featured one; uncheck it to make a featured plan into a regular one. 1. Click Engine Settings > Settings > Payment > Payment Plans. 2. Choose the plan you wish to remove and click the [x] button next to it. 1. In the backend, click Engine Settings > Settings > Payment > Payment Plans. 2. Point and drag the Reorder icon at the left of the plan. In the early days of your website, you can allow users to submit projects for free to get traffic. Choose Engine settings > Settings > Payment and find the option "Disable payment gateways"
Once you've had your loyal users, you can disable this function and create package plans as guidance above.